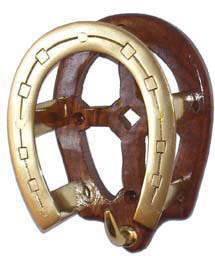 This classic tack room fixture is improved with a solid wood base, heavier duty construction, and high quality finishes. Add style while storing your valuable riding equipment properly. 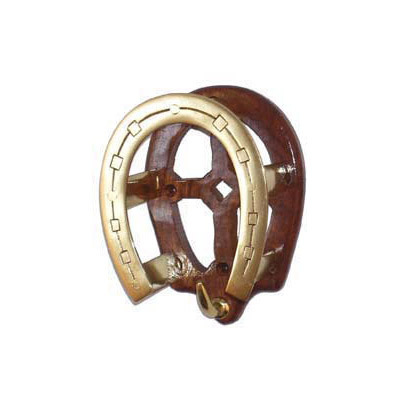 This bridle bracket's arched design supports leather crowns and prevents unnecessary storage wear by spreading the weight of the items over a larger section than a plain hook does. Where most bridle racks are held together with cheap spot-welds, this bridle rack features thick cast metal with bolts securing the parts together. Polished brass hardware gives even a modest tack room a classic and opulent shine. Also available in solid black with wood base.